This piece was written by Ben from the Literature Review HQ. Ben describes his blog as a “Literature review how to – from beginning to end”. Ben has a straight to the point style that resonates with me – and many other readers. Ben kindly submitted this piece on the difference between ‘Marathon’ workers and ‘Sprinters’. As a Sprinter myself, I appreciated some of the advice he has to offer. You can find a permanent link to the Lit Review HQ on the right side bar of the Whisperer under ‘Blogs like us’. I have been told this so many times, as I’m sure you have too. In fact I’ve even said it to other people. The fact is, as an analogy, it’s pretty accurate. Writing a dissertation is a lot like a marathon – and not a lot like a sprint. So what’s my problem you ask… well I’m no marathon runner, I’m a sprinter. Sprinter? Marathon runner? Dissertation? What are you talking about? So writing a dissertation is a lot like running a marathon. They are both endurance events, they last a long time and they require a consistent and carefully calculated amount of effort to complete them and not burn out. Some people are naturally good at this. You know if you are and you recognise it in other people. They tend to be super-organised, and always concentrating. They also tend to be able to get all of their work done in a very rigid time frame. Most people however, myself included are not like that. The mere thought of completing a large writing task often makes you freeze into inaction. You can easily procrastinate if the deadline is far away, “I’ll do it tomorrow”. You occasionally panic and have a spurt of writing activity before needing a week off to recover. You are more than familiar with the concept of an all-nighter. You don’t work consistent hours. The hours you do productive work tend to revolve around feelings of guilt or panic and/or a looming deadline. You can actually write pretty fast when you want to / have to. Are you a sprinter too? Did you answer yes to any of those questions? Chance are you have sprinter tendencies. If you answered yes to most of them, there’s no doubt – you’re a sprinter. So you see my problem with the advice “it’s a marathon not a sprint”. I was not built to “run a marathon” in the traditional sense, it’s just not the way I work. I used to think this meant I could never write a dissertation. The truth is, as a sprinter, it is a bit of a struggle. I always used to feel like I was having a much harder time of it than the natural marathon runners I knew. However, it is possible for a sprinter to run a marathon – in fact, I even think there are some advantages. Make a plan – NOW! One of your fist bouts of sprinting activity should be spent on making a good plan. Get the plan checked over with a supervisor. The most important thing is that there are clearly marked and SHORT sections. By short I mean a “sprintable” length. Something that you could complete in one sitting if you’re focused. Make a timeline. This goes hand in hand with the plan. Make a timeline of when you want to achieve writing goals. It is important to be detailed and to make yourself aware of the deadlines. I always find that as a deadline passes, even if it’s self imposed I feel a bit guilty which strongly motivates me to work. Make lots of self-imposed deadlines and make yourself accountable for them – in any way you can. Be creative on this one. Is your supervisor a bit of a slave driver? Tell them you plan to submit a section of work by the end of the week. Tell your friends, put it on facebook, blog about it – whatever. You need to feel that people are going to hold you to account if you don’t do what you said you would. Sprint and then slow right down. This is golden. Most sprinters have a burst of activity and then stop completely – this can be crippling. You don’t have to stop, and you shouldn’t. It doesn’t matter if you go at a snails pace. If you write one sentence a day for a few days. You need to keep the work ticking over, so that as each day passes, you get a little bit closer to your goal. This is a huge mental boost for when you have your next burst of activity as you’ve been working a little but resting at the same time. Beat the “I’ll do it tomorrow” attitude. Well you don’t have to completely. You can still do it tomorrow – as long as you start it today. Whenever you feel yourself putting off the work, make a simple compromise. You can put it off until tomorrow, as long as you make a start on it today. The start might only be 30 minutes but it makes a difference. Firstly, you will often feel that you want to spend longer than 30 minutes on the work once you get started. Secondly, you will be able to hit the ground running when you do get round to doing the work “tomorrow”. Multitasking. I think it is easier for a sprinter to do more than one project at once. However, you need to make sure you have made a thorough plan of all the different things you want to achieve. Changing writing projects can actually be quite stimulating and allow you to sustain high intensity periods of work for longer. So there you have it. If you’re a natural marathon runner – congratulations and carry on. 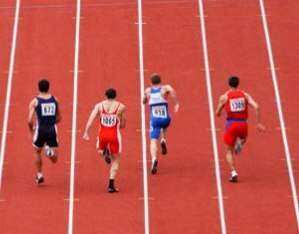 If you’re a sprinter, you can use your natural abilities to successfully sprint your way to dissertation success. Are you a sprinter or a marathon runner? What do you do to help you last the distance? Is losing weight similar to doing a thesis? This entry was posted in Getting things done, On Writing and tagged marathon, organisation, productivity, running, sprint, Writing. Bookmark the permalink. Great advice, thank you. Some of it I’ve heard before, but all of it worth hearing again. My best way to enforce self-imposed deadlines is to plan myself a social commitment immediately after the deadline. Like a holiday away. The fact I don’t want to work while I’m away is a better incentive to meet my deadline than anything else I’ve found! I wonder if anyone is actually a marathoner? Or whether they just appear to be? Other people are always telling me I am a productive, steady worker but I’m not. I appear to be a marathoner, but really I just manage my inner sprinter – with varying degrees of success unfortunately. I agree. I’m also often mistaken for the long term methodical type – but really I’ve just learned ways to force myself to work on a longer term basis by breaking things down to tiny bites of work. As such, I also think the point about accountability is invaluable – this is the only way I got through my last dissertation and it is the only way I’m going to get through this thesis! Interesting point though. I’ve always perceived others to be marathon runners but it’s difficult to know what goes on inside their heads. I might be a marathoner with sprint-like tendencies. Does that make sense? I sprint through some things, and am a bit impatient by nature but have the ability to stay the distance in long-terms activities. Is a hybrid even possible or am I just kidding myself? That makes sense. I think this is possibly the perfect combination and it’s what I strive to do. The trick to any big project is to make sure you keep it ticking over when you are not sprinting. That way you are still making progress, even when you are less productive. Then when it comes time to sprint you have something to build on. I used to think like a marathon runner, just keep plodding you will get there. Now I have discovered that my productive work stratergy is more like “scouts pace”, run 50 paces then walk 50 paces. I’m not quite a sprinter. It’s great that you’ve found your personal productivity strategy. These things are going to be slightly different for everyone and to find one that works well for you is not necessarily easy. I love this. I’m a total sprinter! I am also obsessive. So when writing the diss I set specific writing tasks and obsessively accomplished them. For me the marathon mentality would have been (and still is) totally counterproductive. I identify with this and I think a lot of people do. It not difficult to get obsessive about a small specific writing task. I think the hardest part is actually setting the task! 1) to celebrate what you have achieved rather than worry about what you haven’t. 2) once the plan is made look at the next section and only the next section. 3) As long as it is moving it is fine. All of these fight against the feeling of being overwhelmed by the whole thing. I’m going to pin this to my wall. Or tattoo it to my forearm or something. I couldn’t agree more. Especially the last one. For me the difference between falling way behind and being on top is keeping it moving. It didn’t matter if it was at a snails pace as long as I kept going. However, as soon as I stopped, that’s when the proverbial wheels fell off! When you’re not sprinting, walk or crawl, just don’t stop completely. I completely agree with you. The PhD is a bloody marathon or a long bushwalk. I’m a sprinter, so I loved the reminders and the new tips from the post and the comments. One trick I read about was spending 15 minutes per day writing down thoughts about the thesis. The most important part: doing it FIRST in the day as a non-negotiable, before doing anything else. The writer recommended it be pre-breakfast, pre-workout, pre-shower: literally the first thing you do after stumbling out of of bed. At times my ‘first’ in reality has to be after getting the kids sorted, but before all other busy tasks or sidetracks. When I stick to this it’s works really well because it helps keep me focused and not stop entirely post-sprint, and inspires me to gear up for my next sprint. Thats a great tip. I think psychologically it covers a number of bases. Making a start on a task, even just a small start makes it easier to complete. Your mindset changes from dreading doing it to wanting to finish and tie off the lose ends you’ve created by starting. Doing it first thing in the morning is the eating the frog principle (I can’t remember where I heard this now). Basically if you have something nasty to do (i.e. eating a frog) you should do it at the beginning of the day. Not only do you not have to worry about this horrible thing anymore, but everything else seems relatively easier.